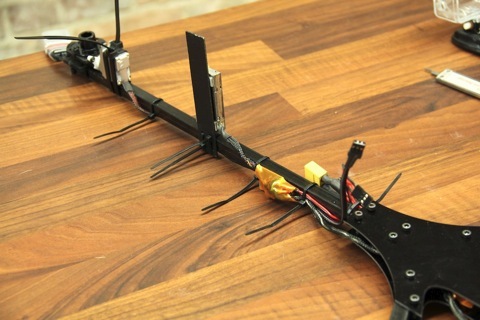 In this build I’ll also try to hide the wiring and make the Tricopter look cleaner and more polished. The Tricopter V2.6HV is based on the Tricopter V2.5, it uses more or less the same electronics and a lot of the build is going to be very similar. Therefore I will not go as in depth on those parts I feel I already covered in the previous build. 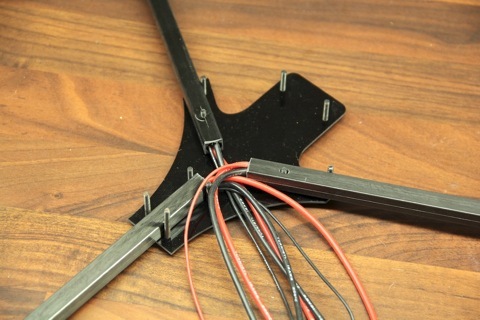 The same old Tricopter frame I designed back for the Tricopter V1. Still work great I haven’t felt the need to change it. One goal with the new V2.6HV Tricopter is to make it look a bit more polished. 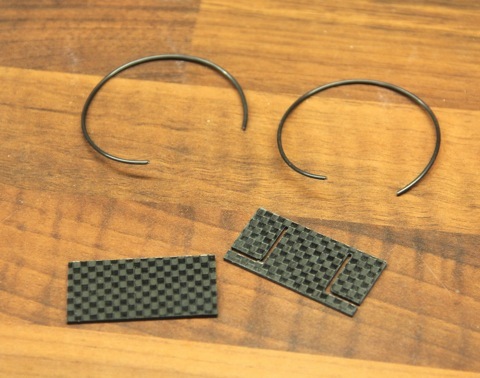 To achieve that I decided to use these hollow square carbon fiber tubes for the arms rather than the wood, this will allow me to hide the wires making it look tidier. The downside is that the carbon fiber is less crash resistant. I recommend using wood arms if you’re not already an experienced tricopter pilot. 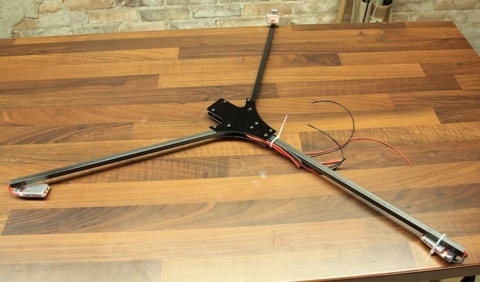 The tricopter V2.6HV will use shorter arms than the V2.5 for a couple of reasons. 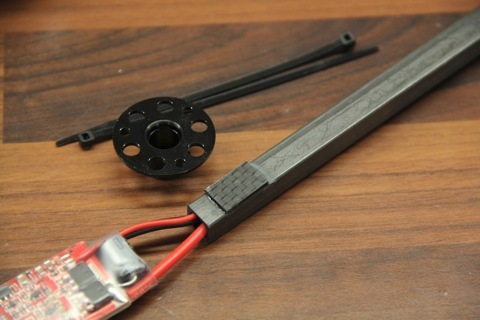 It’s easier to pack in a suitcase with shorter arms, I’ll be using reflashed ESC’s which will more than compensate for the shorter arm length when it comes to stability and the carbon fiber square tubes comes in 750mm lengths and it’s convenient simply to cut them in half. Be very careful when drilling the carbon fiber arms. Do not use any force or they will crack. 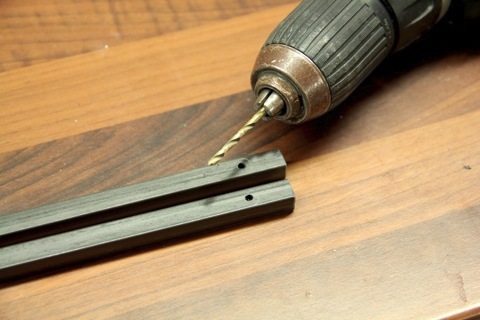 Rather let the drill-bit cut through the fibers in its own pace rather than forcing it. If the arm crack it will be severely weakened. Time to fix the ESCs. To get the highest possible stability, I bought the Hobbyking F-20A ESC’swhich I’m going to re-flash with Simon K’s awesome firmware. The modified firmware has little to none filtering of the PPM signal which means that the throttle response is much quicker. There are a number of different ESC’s that can be re-flashed (more info in this thread), I choose the F-20A ESC’s due to the fact that it has an external oscillator and has programming pads that are really easy to get to. 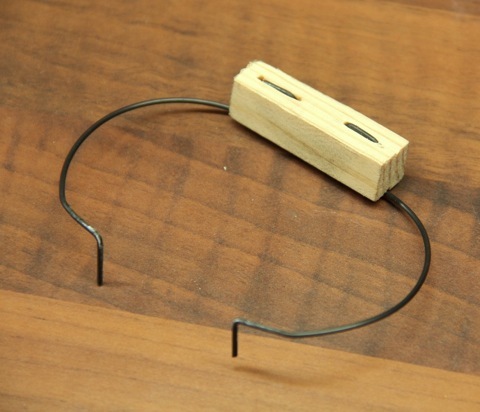 I made a super simple quick connector out of a clothespin and some rigid wire. I simply clamp the clothespin over the programming pins and go. Barely takes a minute to flash a new ESC now. I removed the old wires. Then soldered on some new ones. 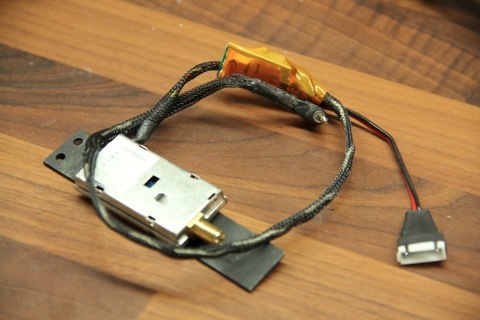 For those wondering what heatshrink I used to cover the ESC’s, here is a link. 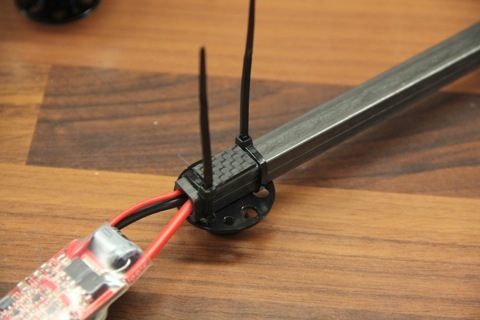 In this version I decided to mount the ESC’s at the tip of the arms rather than the root. This was mainly for convenience as I didn’t want to cut any extra holes in the carbon fiber and I didn’t want the ESC’s mounted on or under the frame. The wires will be hidden in between the two frame plates. Looks pretty neat and tidy so far. Time to solder the power connector. 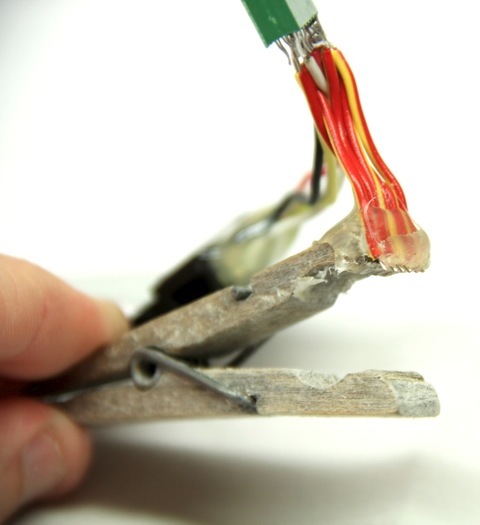 Remember to put the heatshrink on the wires before soldering. The V2.5 tail mechanism has worked flawlessly so I’m going to use it on this build as well. A quick spray with some black paint made it fit in better wit the black arms and frame. 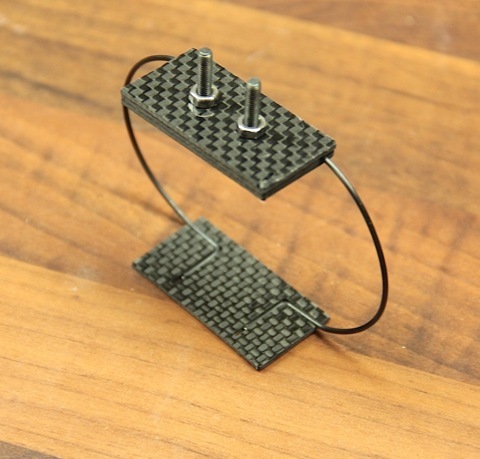 I covered the servo lead in black 3mm wire mesh to make it look nicer. 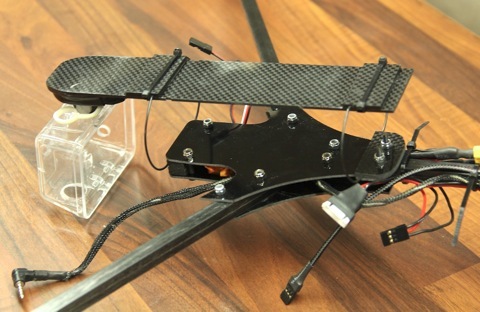 One problem with the carbon fiber arms is that the zip-ties can’t ”bite” into them preventing the motors from sliding back and forth. To fix this I simply glued a small piece of scrap carbon fiber to the bottom of the arm. Now the motor can’t slide anywhere. 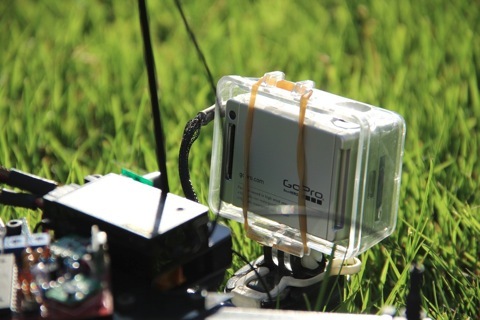 The FPV system. 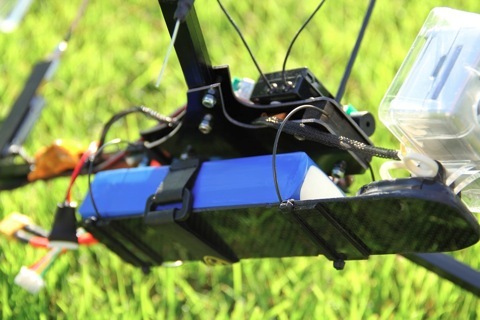 A 300mW 1.3Ghz transmitter with a AnyVolt micro. However I do not recommend using the AnyVolt micro on a 4S system as its not rated for 16.8V. I’ll post my permanent solution further down. 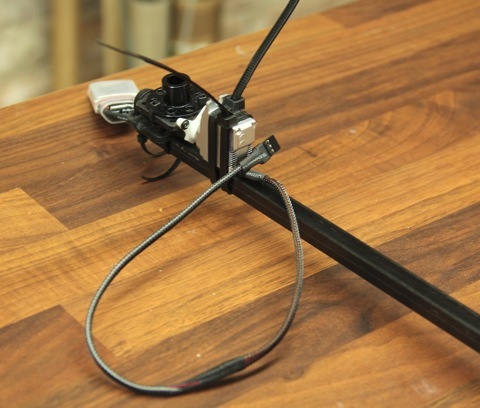 The FPV transmitter mounted on a glass fiber piece on the back boom. Ok time for the exiting bit. The new vibration dampening system. After a lot of thought, research and testing this is what I came up with. A solid wire dampening system. 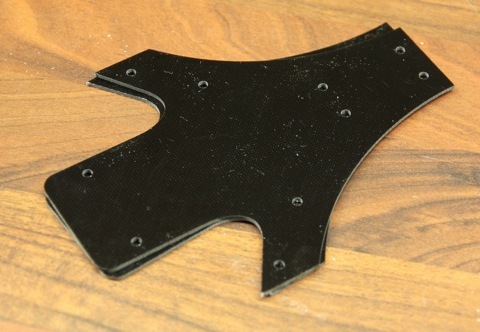 To simplify mounting I cut two L shaped tracks in a 1mm thick carbon fiber plate. The piano wire is then pushed into the tracks and then sandwiched between two untouched carbon fiber plates. Here is a shot of the complete dampener that shows the 90° bends pushed into the tracks. I made the front dampener a little differently. I used the already existing 40mm wood piece that is mounted in between the plates in the front of the tricopter body, to hold the top of the dampener. 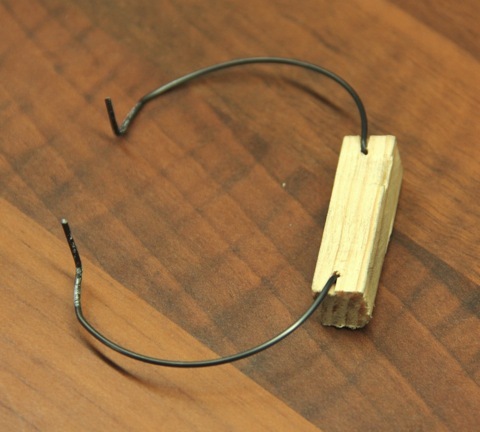 I drilled a small hole and inserted the wire, I then bent it at 90° so the wire was parallel to the wood and then bent it another 90° a bit further in and pushed into the wood. The important thing is that the mount is stiff and can’t flex in any direction. I had this camera tray laying around since an old tricopter build. 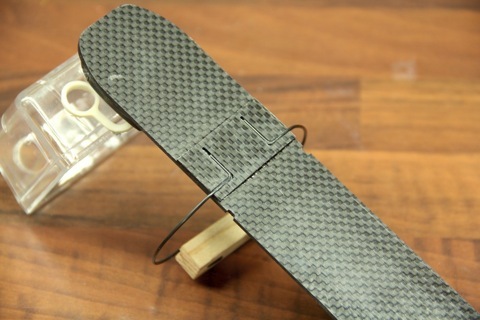 It’s made from 1.5mm carbon fiber. This is how I attached the dampener. Simply glued the 1mm CF plates with the L shaped tracks in it to the underside of the camera tray. I then glued one of the untouched 1mm carbon fiber plates on top of that. Just to make sure I wrapped a zip tie around the mount. Now to the theory of the new solid wire dampener solution. 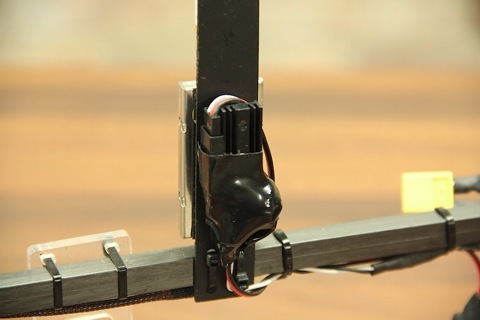 The vibrations created by the motors and props spinning has to travel through the thin wire to get down to the camera plate. Since the camera plate is stiff the whole camera plate has to vibrate for the camera to vibrate. With the heavy 4s3000mAh battery plus camera mounted on the camera plate, a lot of energy is needed to get it moving. The thin and stiff 1mm piano wire has a pretty high resonance frequency and the vibrations will have a hard time to travel down to the camera plate. The few vibrations that does make it down has so little energy that they are absorbed by the heavy battery and camera. Time to mount the electronics. I still use the good old KK board. The KK2 wasn’t released when I started the build. DT750 Motors and 9×4.7 props mounted. Ready for flight. Front dampener. I painted the wood black to make it blend in better. Old Man Mike optimized 1280mHz Pinwheel antenna. The GoPro case I use is lightened by removing unnecessary material. The steel screw is replaced by a plastic one, the buttons are removed and the holes enlarged. I also removed the protective lens. Not to make the case lighter but to improve the image quality. 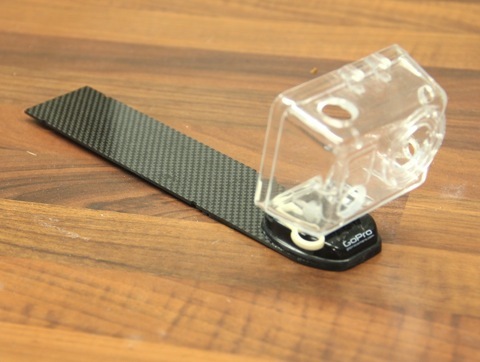 Having the rubber band holding the camera in place instead of the plastic back allows the camera to be pushed in when something pushes on the lens, reducing the risk of scratches. The 4s3000mAh battery mounted on the camera tray. I tested the solid wire dampening system with unbalanced props. I used my Iphone 4 running an app called iVibroMeter. Strapped straight to the frame it recorded an average of 55mm/s2 during a hover. I then moved the phone to the back of the camera and strapped it down tightly. It recorded an average of 5mm/s2, a reduction of over 90%. Very impressive. 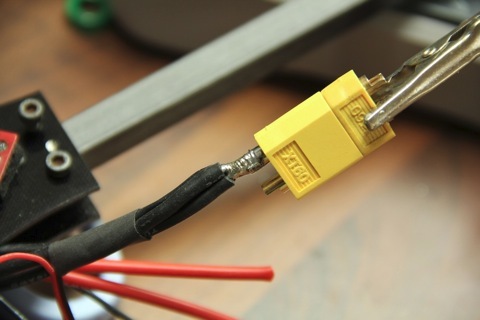 Ok here is my permanent solution for getting stable 12V to the FPV transmitter from the 4S main pack. 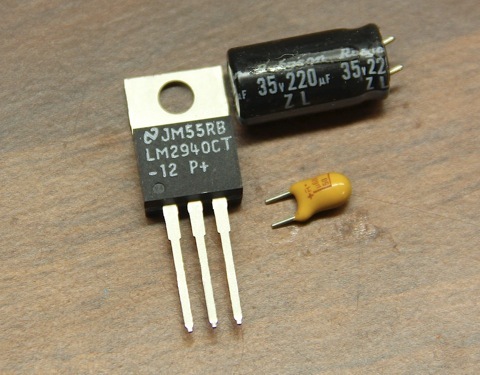 A LM2940 low voltage dropout regulator. This is a linear type voltage regulator, which means that it burns off excess voltage as heat. Linear regulators aren’t as efficient as a switching type voltage regulators. So why use a linear voltage regulator? – The answer is: Noise. 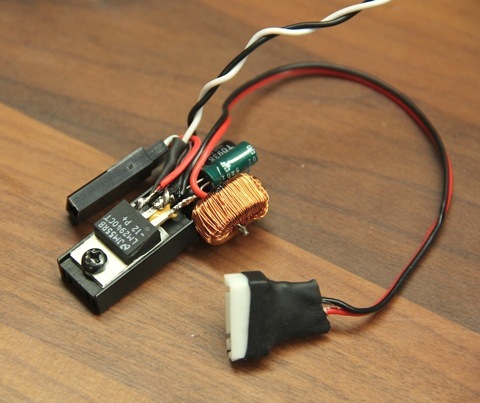 A switching voltage regulator works by switching the input voltage on and off, charging an inductor. It does this at a fixed rate of 50000 to 100000 times a second. Depending on the voltage and current needed by the circuit you’re powering, the regulator will be turn on for a longer or shorter period of time. Letting more or less energy pass through. This is a very efficient way of regulating voltage as it wastes very little energy. But it also emits loads of radio frequency interference. Meaning that it actually acts as a transmitter of noise. It also produces noise in the output voltage also known as ripple. Our analog video transmitters and cameras are quite sensitive to this ripple, which can create lines and interference in the picture. And on top of that the radio frequencies emitted by the switching voltage regulator can also reduce the range of the RC link. A linear voltage regulator on the other hand actually reduces ripple and doesn’t emit radio frequency interference. The downside is that they reduce voltage by burning of the excess as heat. But in this application it’s not too bad, as the voltage difference between the input and output is pretty low and the current we need isn’t particularly high. 1.44W of wasted heat is not much in our type of application. To put it into perspective; If you have a flight time of 10 minutes on a 4s3000mAh battery and use a switching regulator for the FPV transmitter. By replacing that with a linear regulator, you would loose about 1 seconds of flight time. However the linear regulator usually weighs less than a switching regulator, which actually can increase the flight time compared to the switching regulator. A problem in our application is that voltage regulators normally need a couple of volts higher input voltage than they can deliver as output voltage. This is true for both linear and switching type regulators. This is problematic as the voltage of a 4S battery varies between 16.8V when fully charged down to 12V when fully discharged. If you want to use a switching regulator you need a ”step-up”-”step-down” type which actually is two regulators in one. The first one drives up the voltage to say 50V and the second one drops it down to 12V. This type of regulator can operate at a very wide range of voltages and can even output a higher voltage than its input voltage. These regulators however generate even more noise and RFI. When it comes to linear voltage regulators they typically need 3V higher input voltage than the voltage they output. However there are a type of linear regulators that only need 0.5V more input voltage than the output. These regulators are called LDO regulators or low dropout regulators. 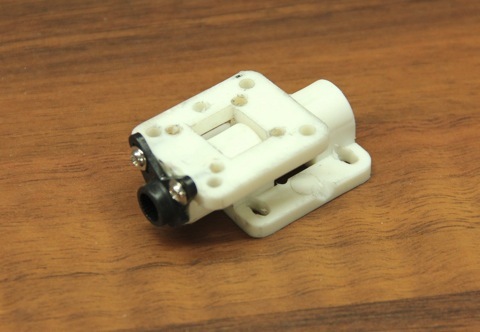 And it is this type of regulator I will use to power my FPV transmitter. My choice is the LM2940CT-12 low dropout regulator, that is capable of delivering over 1A of current in the TO220 package. It has a typical dropout voltage of 0.5V at 1A and 0.1V at 0.1A. However it does have a quirks to it that need to be explained, and that is that it requires a very specific ESR value capacitor on the output to be stable. The capacitor needs to have a ESR between 0.04 and 5 ohm across its entire operating temperature and needs to be 22uF or bigger. This capacitor needs to be mounted as close to the voltage regulator as possible. Other than that its just like any other linear voltage regulator. I rummaged through my mixed electronics box and found a Rubycon 220uf 35V capacitor that happens to have a ESR of 0.056 to 0.19 ohm. Perfect. Thanks to the low dropout voltage the LM2940-12 is perfect for a 4S setup. It’s going to hold a perfect 12V output all the way down to about 12.5V, by that time your multicopter is probably falling like a rock due to the battery being about 99% discharged. But even if the battery goes below 12.5V the output of the regulator is simply going to output 0.5V less than the input voltage. Most video transmitters will loose video sync somewhere around 8-9V and by that time your 4S battery is permanently damaged. I’m very particular about my video link and I tend to go overboard when it comes to filtering, but I rather have a perfect picture than not adding a gram of extra components. 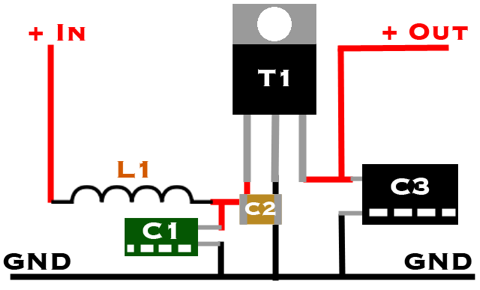 Therefore I added a pretty powerful LC filter to my circuit. You might skip it or make it smaller if you find it too cumbersome. Here is how I hooked up the voltage regulator. 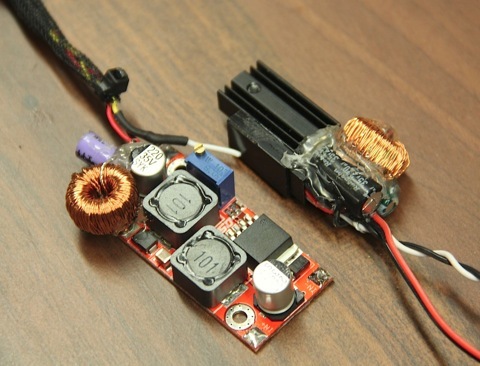 These two components make the LC filter and is there to remove any noise generated by the ESC’s or anything else hooked up to the main power-leads. – C2 is a 0.47uF Tantalum capacitor recommended to use in the LM2940 data sheet. Here it is all soldered up. Not my prettiest work but its solid and compact. I’ll add some hot-glue and heat-shrink to protect it. 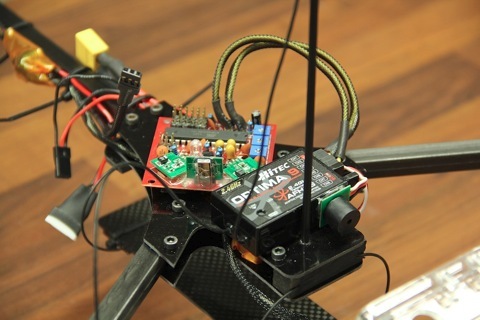 Notice that I use a balance connector to power the FPV gear. This lets me power up the FPV gear just before I need it instead of having it on all the time producing heat and reducing its life span. Note also that I mounted the LM2940 on a small heat-sink. When sitting stationary on the ground the 1.44W of waste heat will heat up the TO220 package to a pretty toasty level. Better have a small heat-sink and be sure it never overheats. Here is a comparison to the foxtech step-up-step-down regulator I tested out before building this regulator. It spewed out a lot of RFI and even with a hugh LC filter on the output still produced noticeable lines in the video. Also the linear regulator weighs less than half. The video is crystal clear and not a hint of interference even with the wildest of throttle changes. I cant belive I am the first one to post here! When you gonna show some videos with that puppy? Wanna se that anti-vibration sistem in action. on the project QAV500 from FPV manuals? Glad to be here! It’s coming 🙂 I just have to take the time to sit down and edit it. Nope never missed it so far, but I plan on adding one just to see if I can make some new interesting angels with it. Being new at this, maybe you or someone could post the settings you would use with this build and a KK2.0 board, plus radio settings. Being new leaves us in the dark bc most setup info has the old three gyro setup. Also, after flashing the ESC’s as per the build, they don’t respond to the ESC program card. Any help would be great. Thanks for the great projects, I thought they were gone today, but glad to see them back. I’m working on posting a guide on the KK2 settings for the tricopter. …just remember the throttle calibration. – Next go for the I setting, increase it on increments of 10 and see the behavior, if from the settings tends to tilt to one side or yaw, the it is too much, decrease then you are done. Just remember if you don’t have a good vibration free platform then you won’t be able to properly calibrate, noise is the enemy to sensitivity. Oh, and for the autolevel feature, it calibrates when you arm the board so if you want to use it put the tri on a flat sufrace for takeoff, also try it a few mistakes high the first time. Im making mine for a 3S setup. My Tx and camera run fine all over the battery span, I would just like to get rid of the noise. So can I just use an LC filter (1mH + 470uF) or does the regulator contribute to the filtering? This design is somewhat reversed than yours. If features a small value coil, and a big value capacitor. Also fetures an optional diode (reducing the noise in half)? Sure you can use just the LC filter to filter noise. It’s very effective. A larger coil will eat more noise, to be even more efficient you can use a small, medium and a large capacitor together as they filter different frequencies. Thanks.I didnt know that you can use multiple capacitors (wouldnt the capacitance just sum up?). 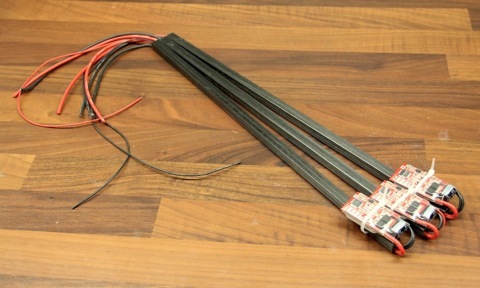 When using long (0.7m) leads – does it matter where you include it to the circuit? Near the battery or near the Tx? The capacitances will effectively just sum up at lower frequencies, as you would expect. At higher frequencies, though, the parasitic inductance and resistance of the capacitors will cause them to have less effect than expected. Smaller caps have less of these parasitics, so they work better at filtering high frequencies. You’ll often see this on circuit boards, where there will be a 10uF-100uF electrolytic cap with a .1uF-1uF ceramic cap in parallel. The big capacitor will be able to deal with larger lower frequency noise, and the small cap will take over at higher frequencies, where the big cap’s ESR/inductance make it ineffective. 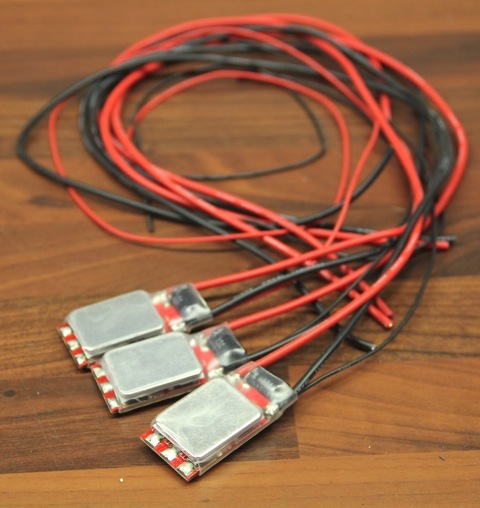 what do you think about these ESCs http://www.hobbyking.com/hobbyking/store/__25364__Turnigy_Multistar_20_Amp_Multi_rotor_Brushless_ESC_2_4S.html? should one buy these instead of turnigy plush as these are intented for multi rotor use, have you tried them? 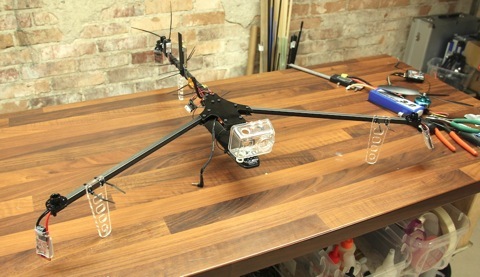 Looking forward to some flight videos of this version…. With the ESC’s mounted way out under the motors with very long power leads are you not concerned about ripple voltage? I thought that this would drasticly shorten the life of the ESC? It shouldn’t really be a problem. The input caps on the ESC are there for exactly that reason, and additionally, most of the stuff on the ESC isn’t too sensitive to a bit of voltage fluctuation. The microcontroller is powered from a 5V linear regulator, so everything is pretty smooth on the low voltage side, regardless of a bit of variation on the 16V input. so… new web site… Congrats!! 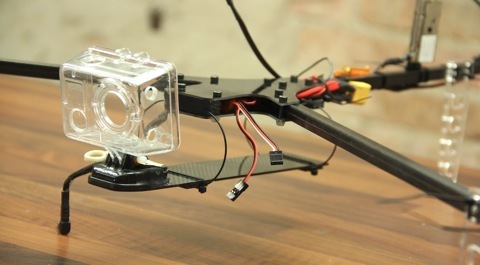 but when is going to appear a video of the new tricopter design??? What is the black tube at the front of the tri for? It does not appear to be related to the Rx? 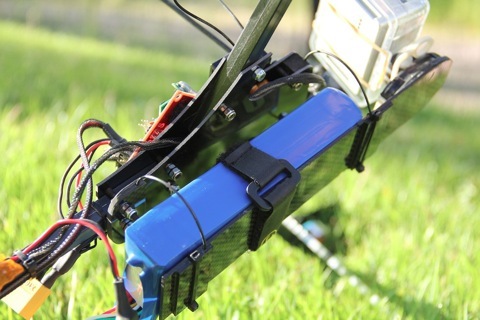 Is the small buzzer at the front a simple loss tricopter finder? The servo wires from the ESC’s appear to be missing from the pictures? There are only 2 servo wires I can see and neither have a signal wire? PUZZLED! Any advice regarding the above will be gratefully received. have You/plan to use the DT700 motors? 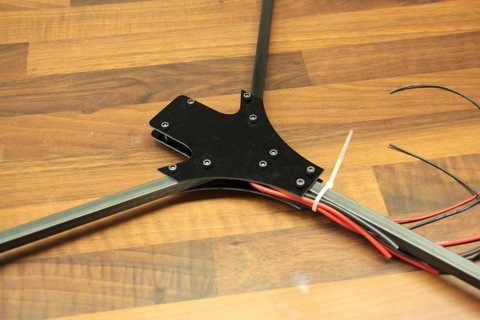 Would you make/sell a larger tricopter frame? 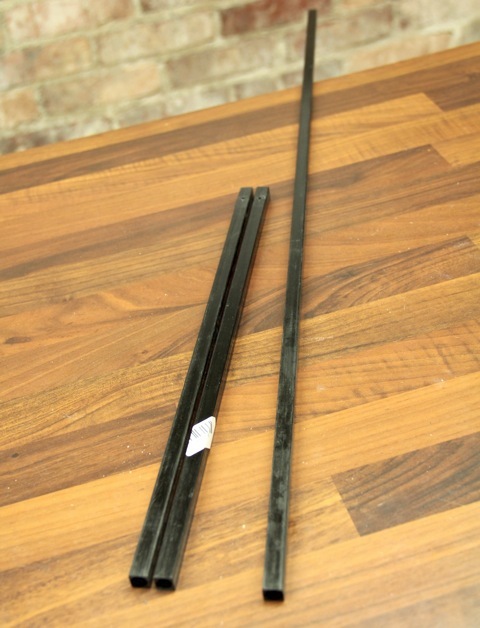 Its hard to find 10mm wooden dowels in the US, unless you cut it yourself. I really like your frame design but I have been using 1/2inch dowels which are too big for the current frame you offer. I used my printer options to enlarge the frame to make it work with 1/2inch and it works well, but I am currently using plywood for the frame and its a little more flexible than I would like. 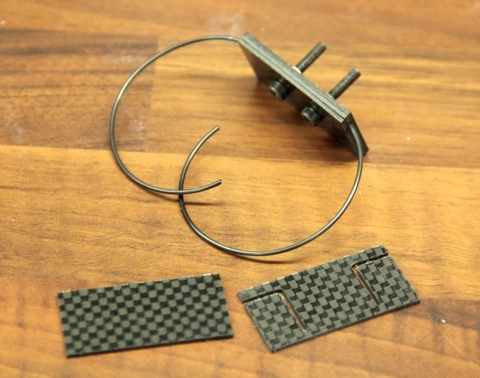 hi David i am all new to rc and i like the tricopter so i gonna build one but one question i ordered carbon fiber booms and then i heard that this will disturb the signal. and when i am looking right hear you use it everywhere does it disturb your signal? Awesome build log as always David. 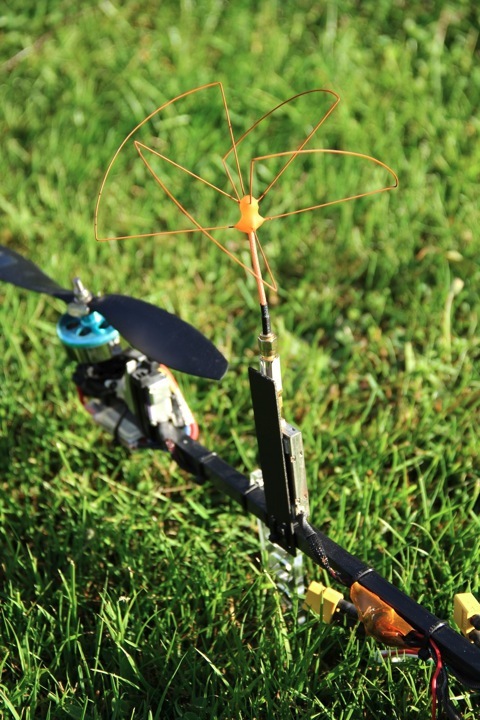 I’ve just replicated the wire vibration mount on my tricopter. Can’t really say I’m too confident mine will work any where near as good as yours though! When I bump the battery/camera try it wobbles all over the place. Saying that, I haven’t actually flown with it yet. We’ll see how it goes! So I haven’t had any luck with the piano wire. I’m thinking the 1mm wire I have must be a lot more flexible than the stuff you have David. I tried a couple of different lengths of wire but it always seems to flex too much – even with a very short loop. Back to the foam for me! Thanks a lot David. that is extreamly amazing. I really appreciate the great work and for sharing all this valuable information. David, theres a way to get rid of the props on the screen? Thats so annoying and can’t use the image as a commercial pro grade. Any tip? Thanks Adcopter, I saw that tip in on of the Tim Nilson vids, was wondering about stability, but after your awnser Im confident! The motor DT-750 can support 4s 3300 mAh cell? Easily ..just make sure you have 20 amp esc’s for 9 inch props and 25~30 amp esc’s for 10 inch props …going beyond 10 inch props will cause motor heating issues…I use 5000mAh 25C 4s packs on my tricopter with the DT-750’s ..this is because with the kind of air flow the open windings allow I am pretty sure these motors perform better on 4s..than on 3s..they give more punchy throttle response…..I know people who run DT-750’s with 11 inch props on 4s but …this may lead to the motor drum becoming hot (Enough to cause permanant motor damage) and the magnets may lose their strength..leading to lower torque..which may further lead to your motors not being able to change their speeds quickly because of prop inertia…and hence may lead to crash …even with a well tuned Flight stabilization board….I have crashed a lot ignoring such small details and pushing my motors to smoking hot temperatures by over amping them…so beware…!! David’s tricopter whit a 4S 5200mAh is exactly what I want to build but I am afraid it is a little bit heavy for DT-750 motors: could you give me your flying weight (AUW?) (Whit FPV? ), at what throle do you hover, and your flying time? Do you describe somewhere your building (to better know your equipment/camera…)? Would this capacitor work on the voltage regulator? a 1mm piano wire and that is so soft, cant hold anything. Could you double check it fo us? Saw other pilots complaining about the same issue… Thanks David, youre the best! I just went downstairs to measure it. It was actually 1.2mm! Good call! I’ll change that in the guide. I tried 1.5mm on my latest build and that works really well. I just wanted to say you eliminated a massive about of electromagnetic interference by placing the esc close to the motors, it’s not current that generates RF noise it’s changing current. So there should be almost no noise in your video. What about the ripple voltage? When you extend the power leads like that you are greatly increasing the chance of causing problems. 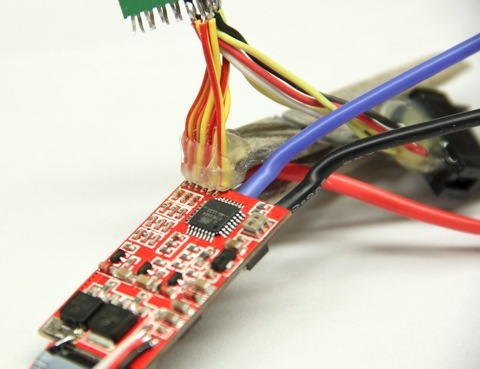 Additional capacitors close to the esc are normally required to eliminate this issue. i see David is using a 9ch rx… is it possible to run a tricopter off a 4ch? The hobbyking ESC has been out of stock for a long time. Do you recomed me any other good ESC that I could use. I also want to flash it. David what prop dia. 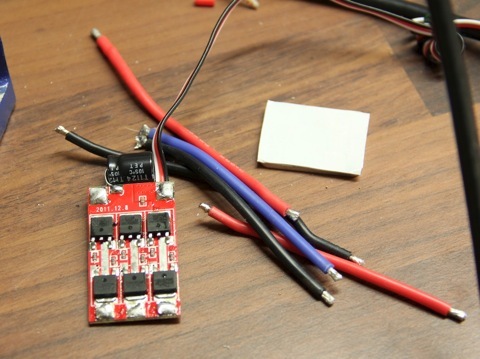 are you using on the 750’s with the 4S lipo? 10in? Looks nice and clean build! Im planning to use some Dt700’s on 4S 10in for a Disco quad, and give some vacations to the RCtimers 750’s xD. I’ve found a couple of online sources for capacitors with specs similar to what David used, but ESR values are not given. If someone could help me out with some links (preferably in the USA) for the parts required to make one of David’s regulator/filters, that would be great. I’m glad the info was just posted about using heavier wire. I just relieved some 1 mm wire in the mail, and I was just about to use it. After reading that 1.5 mm works well, I switched to some 1/16″ wire I had on hand. It’s very close to the same diameter as 1.5 mm. WE will soon see how well it works! i always have to manage all channels to achieve a ‘stable’ Hovering. Thats realy disapointing me. The Parts are not optimal, i know. But theye all were lying around here. The fram was made of 3mm ply wood. While hovering it alway wants to tilt over,not even fast but slow and continuously if i do not push the rudders. i turned al pots on the board in all positions, but nothings seems to be changing. My ESC are mounted directly under the frame. I also tried firmware V1.6 KK by KapteinKuK but everey single motor has a different drive speed. i would be very glad if you can give me some tips about building and connecting everything. I cheacked all of your building guide and even did so, but something is not correct at mine, i think. Hi everyone. 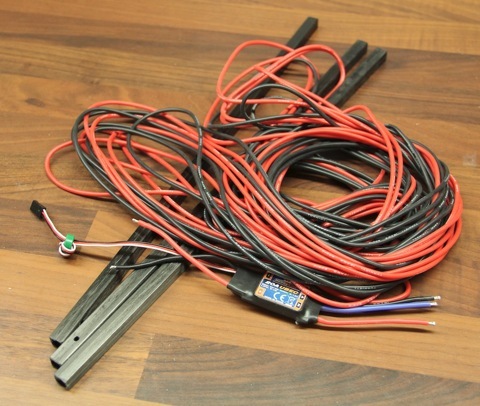 What gauge wires did you use for the esc’s leading from the battery. It also looks like you are taking 5 volts from one of the esc’s what wire are you using so the 5volts makes the distance back to the control board in the middle of the tri. 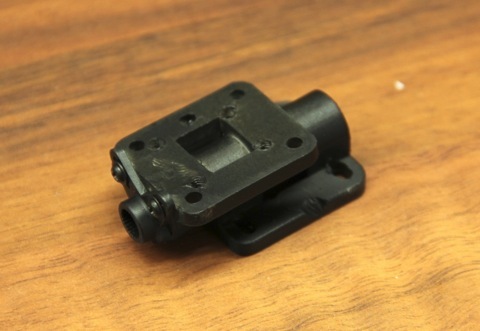 Hey David, I ordered your tri-copter frame on 11/13/2012 however it hasn’t arrived yet. Did you forget about me? I’m in the US so shipping shouldn’t be a problem. Can you help me out? I received the frame, Thanks! The finish is excellent! Would you consider using the vibration dampening method to mount the flight control board for less vibration to the gyros? Or would that increase gyrations? I had a question about the 1mH Coil used for the voltage regulator. Do you have a part number? I can’t seem to find that part online. hi david hi guy’s. if you don’t reflash this esc what will be the effect? if i buy somthing like that ‘Hobbyking SS Series 25-30A ESC’ will do the job? Hi David, congratulations for your work and your site. You experienced Y6, Quad but seem to prefer Y3. Especially over Y6? You prefer lightweight and efficiency over redundancy? would you recommend using common mode chokes and implementing diodes? why/why not? Nice David! I’ve been meaning to ask; would it be wise to scale it down a little bit to run it off of a 3 cell setup? I really love the carbon fiber design but don’t want an aerobatic tricopter, this will be mostly for video production. I’d love to use the multitude of 2200mah 3cell lipos I have lying around. Ideas? Sure you could. Or you could build something like the Tricopter V2.5 🙂 It would be interesting to make one with a little higher KV motors and 9″ props. That would work well. 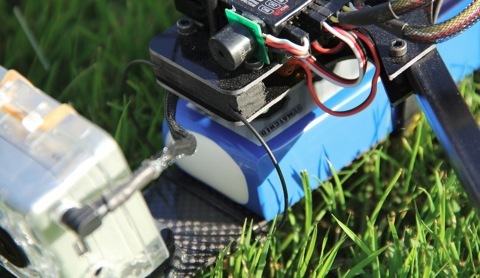 What C-Rating do your 4s lipo use? 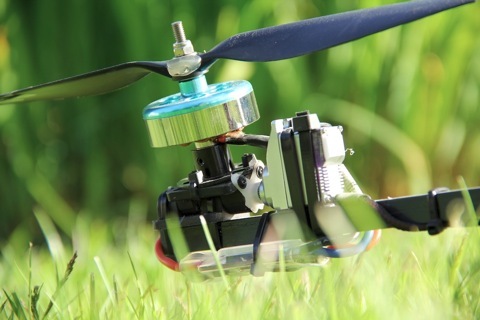 How can i calculate the minimum C-Rating for my multicopters? C rating depends on the capacity of your batteries, multiply the battery mah with you c rating to find out how fast your batteries can discharge, use Ecalc to find out more specifics…. what is the difference between 20A ESC’s and 30A ESC’s? Hi David, how’s it going with posting the Kk2 settings for tricopter v 2.5? Please Help. All the motors have to spin in the same direction? If not, do i need a CW and CCW props? Hello yeroz, did you get the answer? I have the same question. 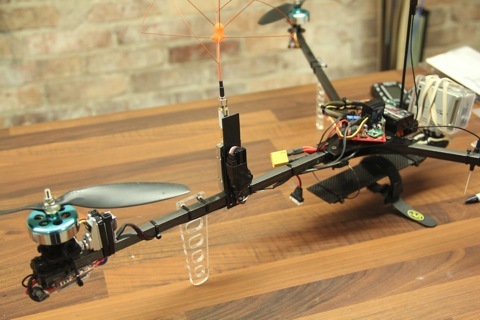 Do you know if we need to put the same prop for the tricopter? or just one needs to spin different? Hi David, can you (or anyone else) recommend a substitute/replacement for the dt750’s they are out of stock everywhere. David, How is the video and power out connection situated on the filter? What connectors did you use? Hello AustinTexan and multi rotor flyer… from another Austin Tricopter flyer. I’m located in Austin as well. New tricopter. Is it possible to see your ship fly someday? Are you flying FPV as well? Hey Lewis. . . I’ve actually moved from Austin recently, but you can check out my videos on youtube(same name). I’m flying a QX-9 currently, actually never got around to putting my Tri together, hopefully soon though. Relative to my filtering question to David. 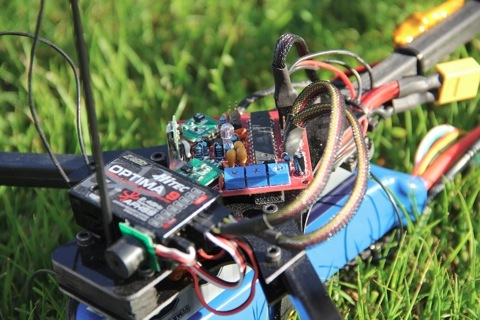 . . I’ve actually changed my FPV setup recently and am only using a TBS Core. I’m on UHF and had heard the Core was pretty RF noisy in my band. To combat this, I’ve wrapped it in copper shielding tape. . .same kind of stuff guitar builders use to shield their pickups against “60 cycle hum”. So far, it works great. I’ve got clean video as well and am not using a filter in front(or back) of the Core. Managed to shave a couple of grams and a lot of needless stuff off my relatively small QX. I know it sounds like an ad for a Core, but it’s a pretty good solution if you’re short on space and need play with two different voltages (I’m running a single LiPo (4S) setup. My Vtx is 12V and my flight cam is 5V. Core can output both of these. They’re pretty cool I think. Solves a lot of problems in a very small space. PM me on Youtube if you have any questions. Question about the regulator: Mine runs at 100 degrees C, even with a (small) heatsink and just 0.4A load at 12V. Is it OK? Does yours do that too? What is the landing gear made out of? 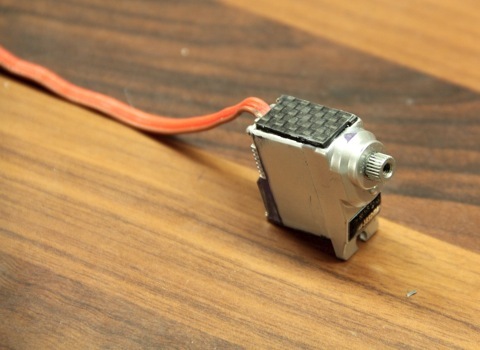 Just waiting to order my stuff for v2.5 but servos are BK… anyone has an alternative for bms-385dmax ? 1) Where is better to put the ESC´s? at the center of the tricopter or at the tip of the booms? 2) All the propelers needs to be right or some must be left? if yes, which motor is the best to be the contrary. If there are more people interested we could start a thread on rcgroups. What size of screw driver do you need to remove the DT750 set screws? Thanks! Great work with very inpiring Projects! Makes it a lot easier for us newbies. I just got bitten by the tricopter bug 🙂 and ordered some Components. I decided to build according to your v2.6HV version since i had a 4s lipo laying around. Unfortunately i did not notice that you where using a 3000mAh lipo instead of a 2200 as in your V2.5 i first looked at. so my main question is why you have shorter flight time with V2.6HV even if you have higher capacity, is this due to higher amps at 4S? One Question regarding the Filter and StepDown Regulator. I read in one forum that first the StepDown Regulator has to be used and after that the LC-Filer. In the design above the LC-Filter is used first and then the step down regulator is used. Which way is the right way? Wouldn’t it make sense to regulate the voltage first and then filter it? The filter on the input is probably just trying to get rid of noise that comes from the battery to the regulator/video system. I can’t imagine that it would matter all that much. I was very interested in this before I started FPV’ing a lot. It’s a great idea and I’ve actually got all the components to make his filter but I’ve never really had noise in my setup. I’m running 4S on a ADS400Q and pulling a lot of amps, but never really noticed any noise. I’ve got a very typical voltage regulator to bring it down from 14.8V to 12V for my FPV stuff. Seems to work fine with just the regulator on there. I’m certain David’s filter would only make it even better, but it’s a few additional ounces and more space on my setup. I still would like to build one at some point though. 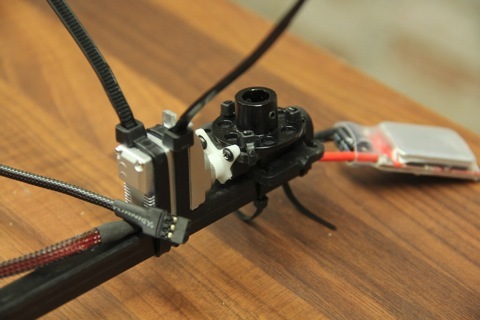 If you build your FPV setup and use standard JST connectors, you should be able to switch them around without any issue to test it out. It’s definitely not going to hurt anything. Ive built the regulator exactly as outlined on your instructions but I am using this to power the brushless gimbal becasue the BG controller board is rated to 12v. I couldn’t find any info on the capacitors ESR rating or how to measure it easily, so I just tried what I have and I get 12.07v output using a 4S lipo measuring 15.35v battery output. I am just wondering what happens if the capacitors ESR is no withing the ESR range you have specified? I get 11.88V, but truthfully I wouldn’t trust my multitesters to be accurate. I used tantalum caps throughout. BEWARE IF YOU USE TANTALUM CAPS – they have the stripe on the side with the positive wire NOT the negative wire. Also, David, you might want to throw a fuse or diode or something in there because if you accidentally plug the 4S battery into the output you will get an exciting shower of exploding glowing yellow capacitor shrapnel and a sound like a 22 caliber gun being fired. for the (C3) capasitor is it ok with this one? it is 22uf, 35v and esr is 8.44ohm is that ok to use? I noticed you have what seems to be an ultrasonic sensor glued to the front of your receiver, what is that for? 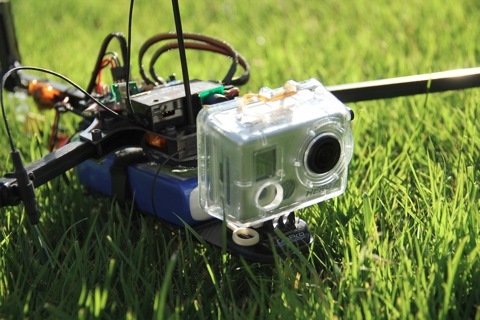 It just looks to be aiming at your gopro…..
It’s just a buzzer for when he lands inside long grass or trees! Do i just cut the booms in half? no other measuring needed? Im currently using 10mm wooden booms which are quite long and they are casing lots of vibration. Can i use a spektrum dx6i with the kk boatd for the tricopter. Can’t i use a turnigy plush esc or the hk red brick esc? What is the total cost of the Raj ct excluding the radio and fpv gear? I mean total cost of the project not raj ct.
I’ve been using this tricopter for a while, and I was wondering if the 4S -> 12V regulator approach is still the best. Given that we have that huge filter, why not switch to a linear UBEC? Is it possible to use shorter arms ? What is the smallest size?